Last May 6 CiberCuba Android app was released on Play Store, and just five days later -May11- it was also launched in App Store (iOS), for iPhone and iPad users. What was not expected is that the Cuba news portal had over 10,000 downloads in such a short time, in the two platforms in which it is available. 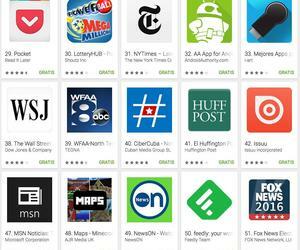 The app ranked in the top 50 "News Apps" in its first week of existence. It is a pride for CiberCuba team that, in just seven days, it has been positioned in the "News" category along with media apps as relevant as The Huffington Post, ABCNews, NBCNews and NYTimes. The app has all the content of the web version – easier and more comfortable- and it can be downloaded for free. The users can receive notifications of breaking news and access the different sections (Politics, Culture, Health, Sports, and Business). With the app, you gain in portability, speed and functionality in relation to the web.